MGB (Multifunctional Gate Box) is a unique interlocking or guard locking system for the protection of safety doors on machines and systems. 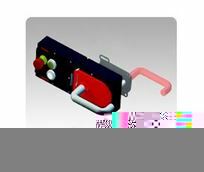 MGB offers little bit more: it is more than a safety switch, more than a bolt, and offers a lot more functionality. Whether interlocking, guard locking, escape release or other functions such as buttons for start/stop, emergency stop, etc. the MGB meets all your requirements for safety-related applications.